Ready to use formula kills unsightly mould, fungi and algae on patios, decking areas, driveways, block paving and most other outdoor hard surfaces. Hazard safety codes: R22, R34, R50. 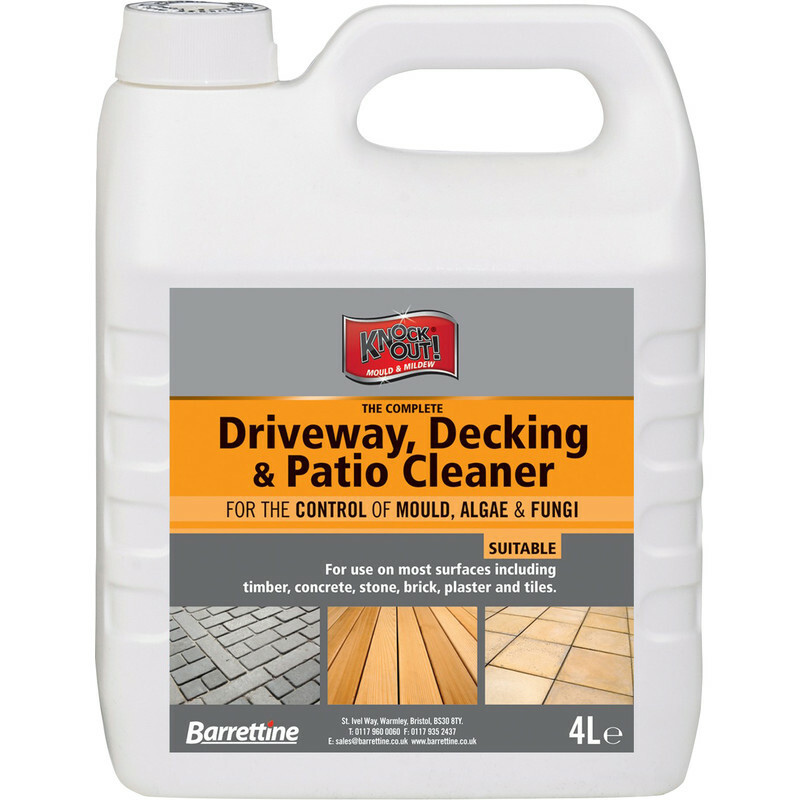 Driveway, Decking & Patio Cleaner 4L is rated 3.7 out of 5 by 17. Rated 5 out of 5 by bonfireboy from Ideal for walls and drive Scrubbed onto algae on house walls, left overnight and scrubbed off, Brillant. Used it for moss and algae growth on a tarmac drive, everything brown in a week or so. Rated 5 out of 5 by Jackie2789 from Great I'm not sure I needed to use this on my new decking but had read it was a good idea before using Barrattine wood preserver followed by Barrattine decking oil. Very happy with the result. Rated 4 out of 5 by Alex the Brush from Works well Follow the applications instructions and it works well. Rated 5 out of 5 by Horsa from Does what it says on the Tin Used 3 containers in Late November to remove green algie from block paving on the driveway and patio areas, Left the solution on all night as it was going to rain the following day, The driveway and patio are now sparkly clean. Rated 2 out of 5 by Ian6969 from Poor Cleaning Thought this would help me clean moss off wall, not good, had to use pressure washer on max pressure to remove the green ! Rated 5 out of 5 by Richnb from ACTUALLY WORKS! Cleaning twinwall plastic roof of a lean too that was covered in algae / moss etc. Poured this on, worked in with a brush and washed off. Cleaned the whole lot! Didn't have to scrub, just made sure it.got to all areas. You could see the algae lift!